bulletins and activity bags are available in the back of the church. ​On certain occasions, St. Paul's offers one combined service at 9:30 am. Be sure to check the calendar before your visit. 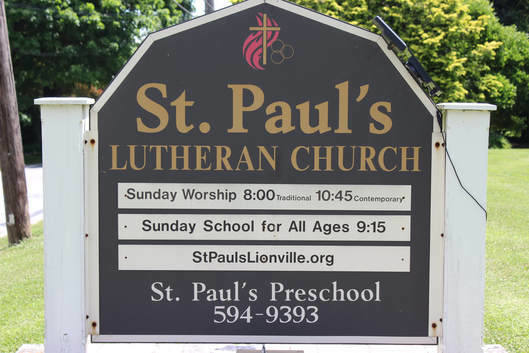 St. Paul's welcomes all visitors to join us for worship and activities. When you come to visit, please stop by our Welcome Center and pick up a package just for you. The small gift bag has the latest information about upcoming events, our opportunities for service and education. You can always stop one of our current members and talk with them too. If you'd like to receive information before you come, please provide us a way to contact you and your questions below and someone will contact you. St. Paul's Lutheran Church is located in the historic village of Lionville. Our address is 104 S. Village Avenue, Exton, PA 19341. If you have any questions before you visit, please call 610-363-6264 or email administrator@stpaulslionville.org.